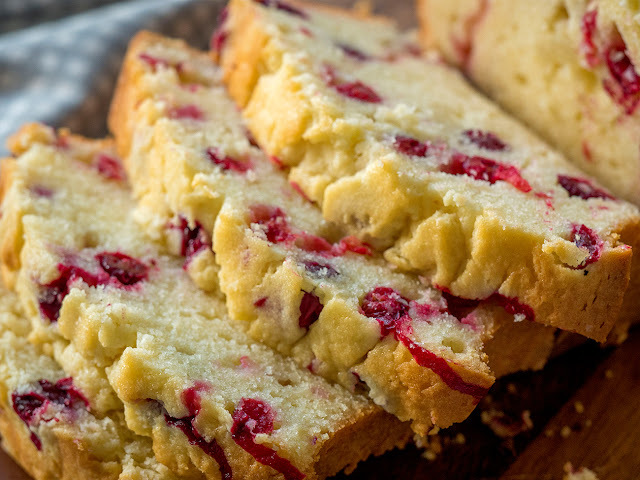 While baking might be at the bottom of your to-do list – if it even makes the list at all – it is totally worth the time and effort (which are both minimal in this case) to make this cranberry cream cheese loaf. It'll get you into the holiday spirit and it'll bring your family together, since no one wants to miss out on a slice of this stuff! Eat it by itself, dust it with powdered sugar, top it off with some more cream cheese, whatever works for you – just try it! Preheat oven to 350º F and lightly grease a 9x5-inch loaf pan with butter or non-stick spray. Cream together butter, cream cheese and sugar in a large bowl or mixer, then, one at a time, beat in eggs and vanilla. In a separate bowl, whisk together flour, baking soda and salt until combined. Gradually mix dry ingredients into wet ingredients, stirring until just incorporated. Place in oven and bake for 60-70 minutes, or until toothpick inserted in center comes out clean. Remove from oven and let cool at least 15 minutes before serving. Enjoy!